Not my choice of a movie, but when I saw Knight and Day (starring Tom Cruise and Cameron Diaz), I got excited seeing Sevilla, Spain and how it covered most of its tourist spots at the end of the movie. I’ll just go through the pictures as how the movie features the highlights of the location, if memory serves me right. 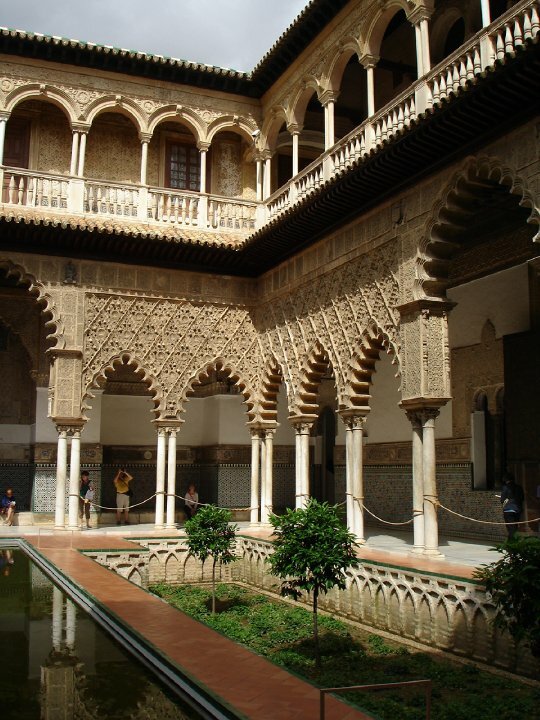 The Alcazar is this spacious royal palace of sophisticated, majestic architecture. As a matter of fact, royal families still live there whenever they please. Keep an eye on the designs. They really are sophisticated and intricate. It also has this huge garden. The movie actually has a lot of walking involved all over this palace. With the nearby cathedral, the green garden of small ponds and ornament walkways and this (picture below) timeworn structure, Filipinos can’t help to reminisce its resemblance to Philippine Intramus. 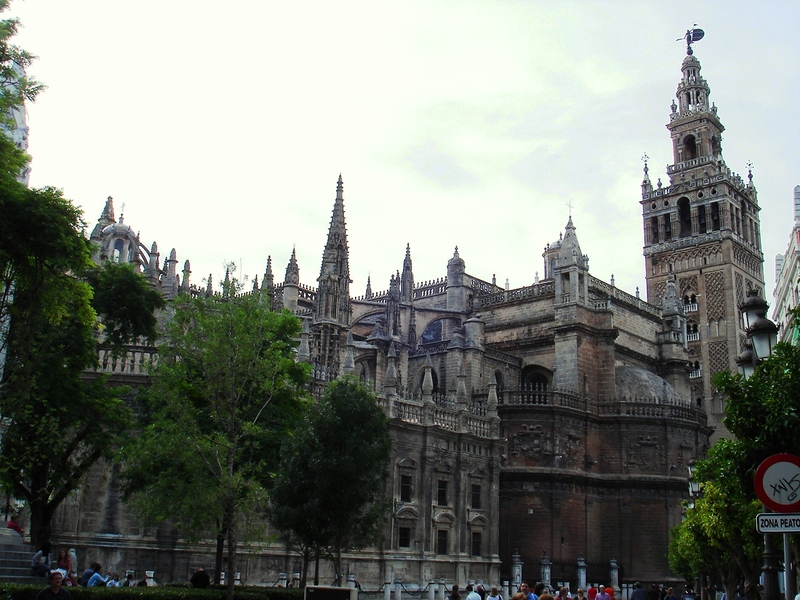 The Seville Cathedral, aka The Cathedral of Saint Mary, is the third largest church in the world. 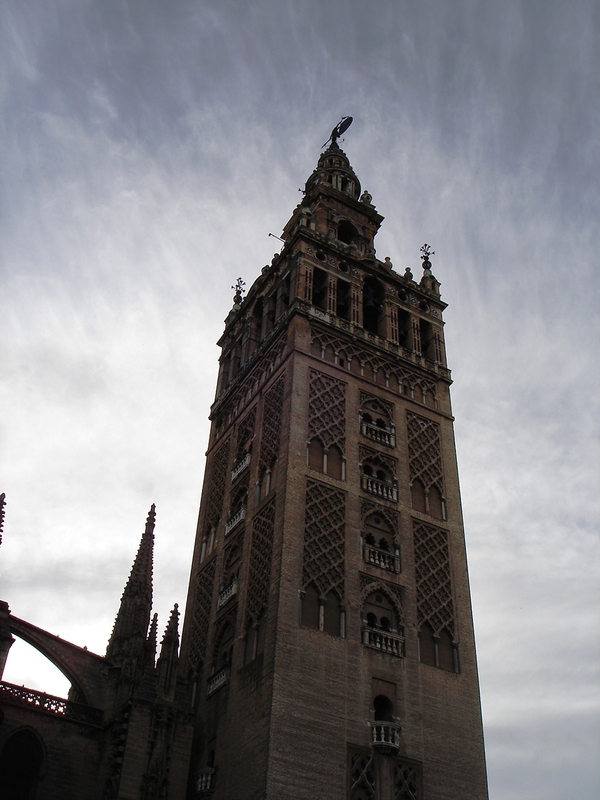 The tower (first picture above) is called La Giralda. Its very top is the statue of La Giraldillo. 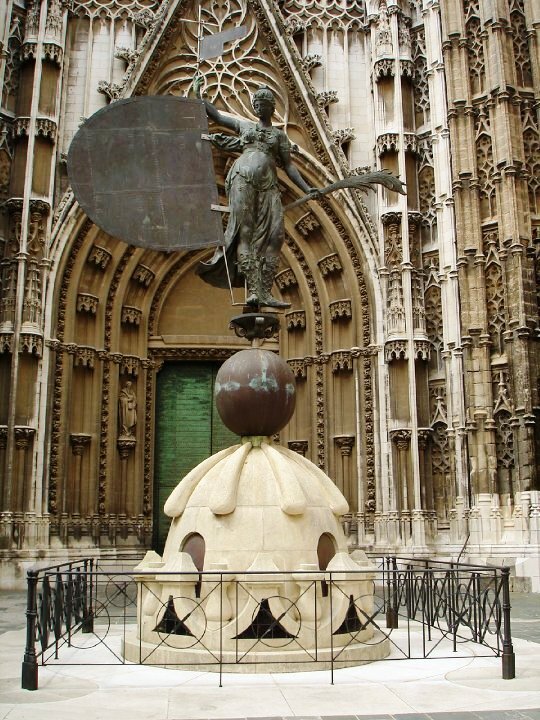 You can spot its replica (picture below) on the ground and on the side of the cathedral. The movie Knight and Day continues on with a chase around the area leading to a bullring called La Maestranza. By then, I was oh-ing and ow-ing recalling my unregrettable visit to the arena. 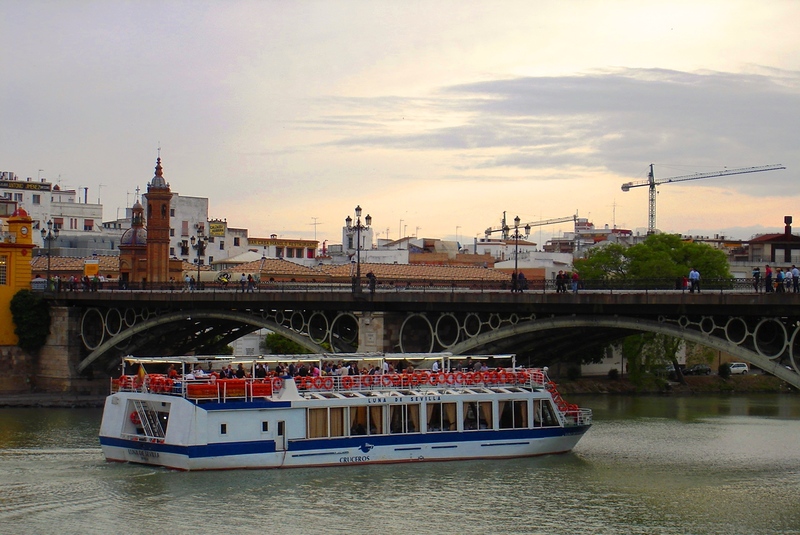 The movie finishes with a stretch to the park along Guadalquivir River, highlighting a watchtower called Torre del Oro. I’m no tita buds so why not check her Freshly Pressed entry of Seville, Spain. tita bud’s blog. The title alone has that hooky, catchy ring to it. More so to her domain having the panache, chic, hip, and fun, all in the right tone. She is also my favorite visitor. A comment from her makes my blog entry complete. She is just one lively and lovely blogger. Lovely! I have few friends in Spain – a great place -hope to be there one day. Thank you for sharing this great pictures. Hi, mydestiny. Thank You so so much for reblogging this entry. I truly appreciate it. thank you and looking forwards to more..hv a great weekend. ^ oops, I’m not from Spain. Anywho, thanks for the visit. The intricacy and workmanship in the buildings you featured is unreal. I can only imagine what it would cost to build La Giralda alone at today’s prices. I doubt, you’d ever find enough stone masons to do complete the job. What a masterpiece! Thanks for sharing. Oooh! The way I was going to do this post was with a slideshow to show more pictures including the ones with the design of the structure. I decided not to because I felt like I already overloaded the entry with featured pictures. It really is magnificent. You get in there, and the palace demands attention to details. And yes, most of my travel the marvel I always had goes to the construction of the site. It never fails to make me wonder. Do you know when the Cathedral was built? It looks like one of those magnificent castles that’s been there 1,000 years. The Cathedral of St. Mary was built from 1401–1519 after the Reconquista on the former site of the city’s mosque. It is amongst the largest of all medieval and Gothic cathedrals, in terms of both area and volume. 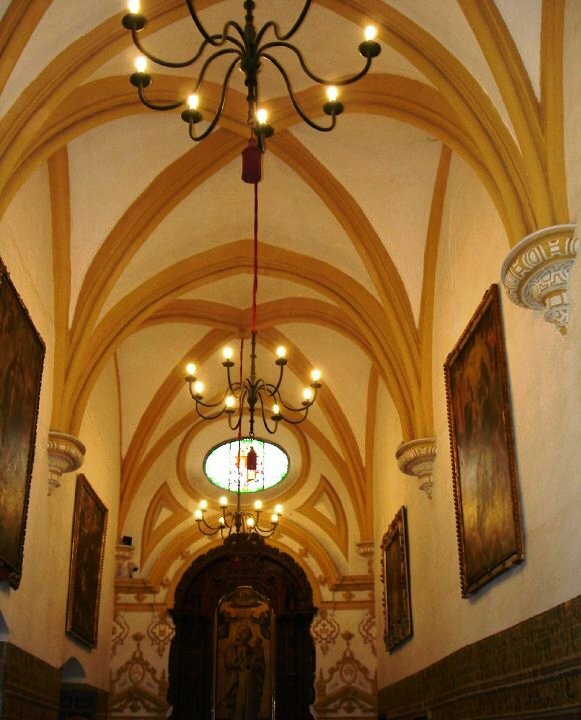 The interior is the longest nave in Spain, and is lavishly decorated, with a large quantity of gold evident. Sorry to disappoint. But yeah, it still does look so ancient that as it appears. MORE THAN 100 YEARS TO BUILD!!! I’ve never been to Intramuros yet but I’ve already seen plenty of the place’s pictures. I must say I could see the resemblance of the structures from Intramuros’. We were invaded by the Spaniards. Influence is there. Plain and simple, I admire your blog a lot esp. because of its charm. :D.
Great picture of the bullring – love the colours – reminded me of my visit there, thanks for the memory nudge! I love bullfight, bullrun and the arenas. It’s just that it symbolizes Spain widely. Maybe in the future, I’ll post my experience watching a matador-bullfighting scene. I’ve never been to Spain! Most Brits go there to lie on a beach or by a pool but tht isn’t my scene. I am interested in the architecture though – particularly the Moorish I think? as in the Alcazar. Maybe one day! The Alcazar suprisingly attracts a lot of spectators actually. And yes, most specifically because of the Moorish style. The first picture looks very solid and great to know the existence of the cathedral. I only wish I can travel there but if not, then I have to satisfy with these magnificent photographs. I saw Intramus only when I was a kid. Even so, I know how well the palace is much like Intramuros. Imagine my excitement entering the location. I have never been to Intramuros but I have seen a lot of images of it. Thanks for bringing me to Spain and around Europe, US, etc..
Beautiful photos. I especially liked the one of the bullring – love the colors! 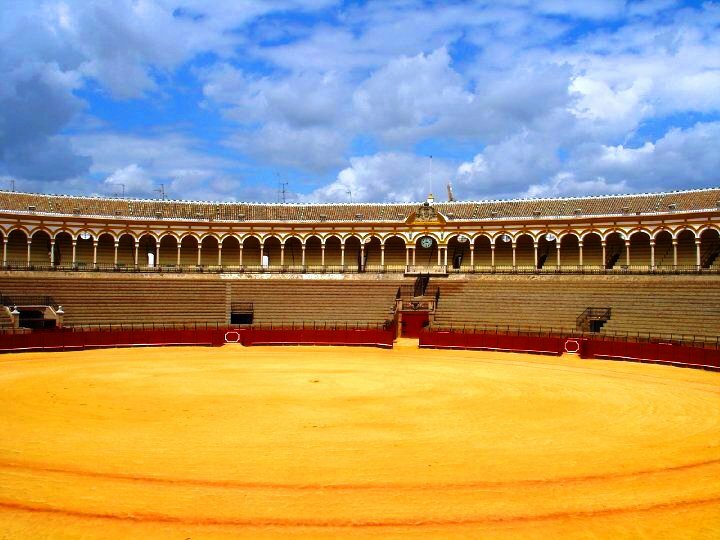 That bullring, may be simple in essence, attracts me as much as the cathedral and the Alcazar. The movie made a good entrance opening one of those red gates and ahoy! the eventful oval. Thanks so much for the visit, happysherlock. Yey! Glad for your visit, Nandini. UGH, i’m dying to see Spain!!! it’s so beautiful! When were you there? I’ve never seen that movie either, perhaps i’ll look into it. It’s a typical Hollywood movie but I really enjoyed watching the Sevilla scenes esp. when they entered the bullring. This post is long overdue. I was there 2008. Hihi. and way cool…i need to make my way there! I like spreading my post topics. That why the late entry. Anywho, when I saw your blog, I really thought to myself on how you reminded me of tita buds – the featured blog of this post. Hihi Just trying to introduce you to her cause you might like her. She also has a new Spain blog entry. thanks for the referral! !…i do love her blog! Fantastic work! i want to visit spain once in my life and i hope it will come soon the architecture is amazing not only in seville but also cordoba, valencia and barcelona i heard that its very fertile country and is there any theme or safari parks as well or not. I’m sorry I don’t know about any safari parks in Spain. I did however went to a zoo in Jerez, Spain. Thank You so much for visiting, Coby Hunt. I love the bullring photo! We loved Seville, I wanted to live in the Acazar. 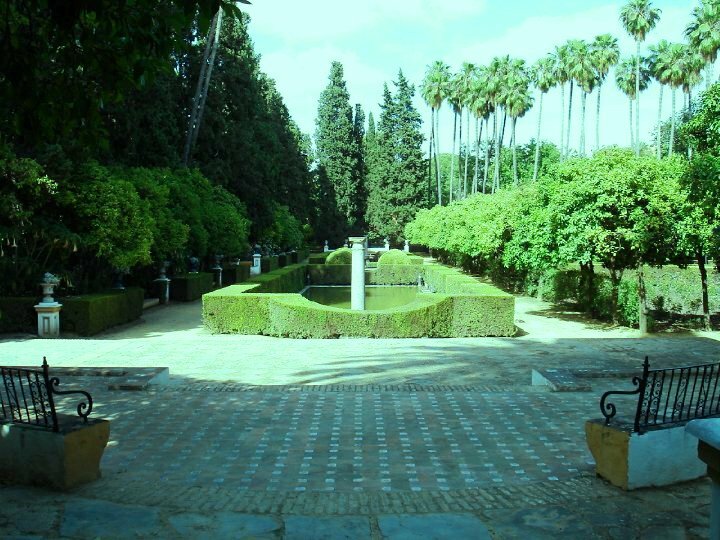 I did a post called I want to live in the Alcazar in Seville. Cordoba was another favourite place and of course the Alhambra. I would’ve loved to have explored more, but I was there for a job assignment. Enjoyed your photos of Seville, has brought back fond memories of a beautiful city, though I was warned by all to watch my handbag, something you get used to as I have to watch my handbag in London every day. I had a lovely time and would definitely visit the city again. Thank you! And ow, pick-pocketing is in every tourist place anyways. No worries. I am just happy to get engrossed viewing your photos. Thank you. I hope so. You take really awesome pictures, and you always capture the obscure places. I would like to see la Giralda some day. Impressive takes, Rommel! 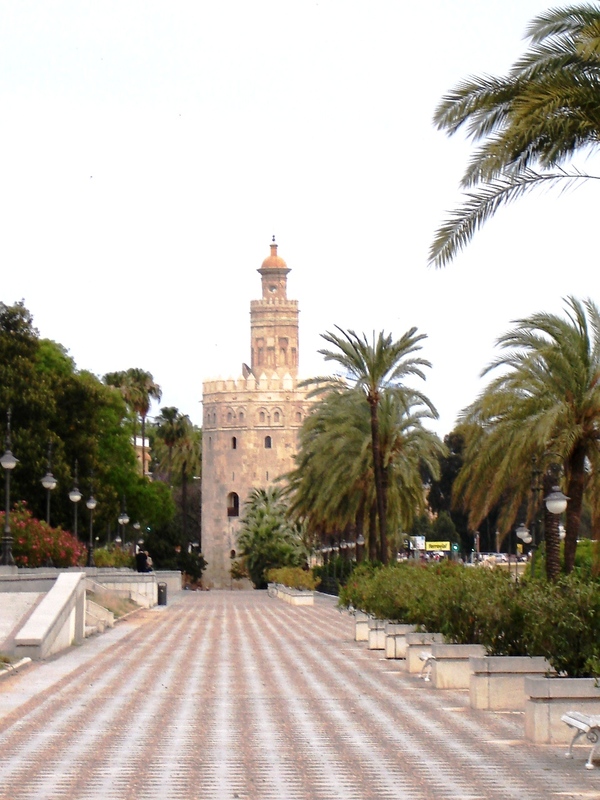 Climbing the Giralda Tower was one of my highlights of Sevilla.